Congratulation's Dustin Daugherty! 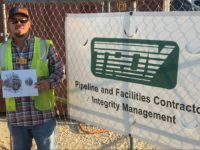 Troy Construction is always trying to improve its safety culture, which has brought focus into developing and implementing the Stop Work Authority Program. The goal to the Stop Work Authority Program is to create a safe environment where all employees can stop work they see as unsafe which will help achieve a safety culture of Zero Accidents and Zero Incidents. To help jump start this program, Troy Construction created a company wide Stop Work Authority design contest. The goal was to create a Stop Work Authority image that can be used on hard hat stickers, banners and shirts. There were over 125 drawings submitted and Dustin Daugherty won with his hand drawn image!